Brazil’s Senate on Wednesday voted to hold an impeachment trial for suspended President Dilma Rousseff, an effort that could mark the end of 13 years of rule by her leftist Workers’ Party. “Today is not a good day for our democracy,” said Senator Paulo Rocha, an ally of the nation’s first female president. He added that “there is a political alliance that smells of a coup” working against her. Rouseff is accused of breaking budget laws, though the federal prosecutor last month found that she did not commit a crime. The 59-21 vote marks “the final step before a trial and vote on whether to remove her from office,” the Associated Press reports. “A verdict is expected at the end of the month and will need the votes of two-thirds of the Senate to convict Rousseff, five votes less than her opponents mustered on Wednesday,”Reuters reports. Rousseff has been suspended since May when the senate voted to start an impeachment trial against her. That meant then-Vice President Michel Temer became interim president. If Rousseff is removed, the unelected, right-of-center Temer would serve until 2018, the rest of Rousseff’s term. 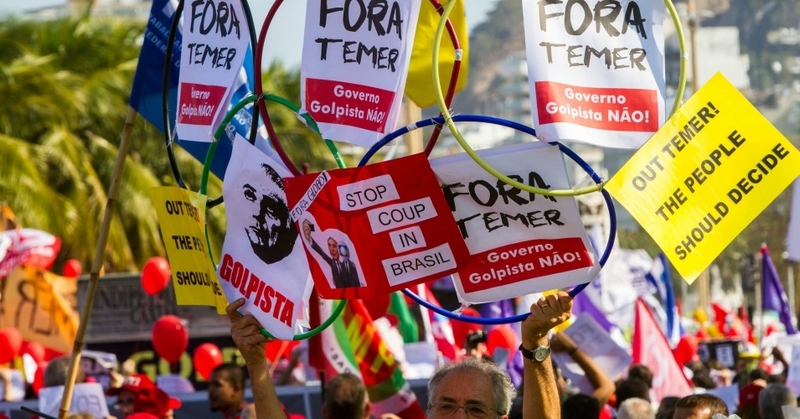 Rousseff has called the effort a coup, and Brazil’s largest newspaper in May published evidence of “explicit plotting” between a top government official and oil executive who said her ouster was the only way to halt a wide corruption probe. “After suspending Brazil’s first female president on dubious grounds, without a mandate to govern, the new interim government abolished the ministry of women, racial equality, and human rights. They immediately replaced a diverse and representative administration with a cabinet made up entirely of white men. The new, unelected administration quickly announced plans to impose austerity, increase privatization, and install a far right-wing social agenda,” Sanders’ statement continued. Just two weeks ago, “40 Democratic members of the U.S. House of Representatives published a letter … expressing ‘deep concern’ about threats to democracy in Brazil.” Similar denunciations of Dilma’s impeachment have been issued by British Labor Party leader Jeremy Corbyn, British MPs and labor leaders, the Organization of American States, dozens of members of the EU Parliament, and Brazil’s first Pulitzer Prize winner. So dubious is Temer’s standing that, as AP reported last month, many world leaders are avoiding the Rio Olympics so as to avoid the quandary of whether to shake his hand. Temer—who chose a Cabinet of “all rich, white males“—is embroiled in corruption scandals and is very unpopular but is “business-friendly,” according to Reuters. This entry was posted in Corporate Personhood, Corruption, Demonstrations & Protests, Economics, Elections, Government, Social Justice, Voting and tagged Atrocities, Bernie Sanders, Brazil, Civil Rights, Corruption, Democracy, Dilma Roussef, Economics, Elections, Michel Temer, political coup, Protests, social justice on August 11, 2016 by ew.